The New York Daily News directs our attention to this Metro UK story, a gripping tale of a man, six lagers, three buns, one phone call, two all-beef patties, special sauce, lettuce, cheese, pickles, and onions. Think of it as a cautionary tale: Be careful what you wish for, because you just might actually get the cops to come to your McDonald’s so that they can arrest you. Leslie McDonagh of Manchester, England left his December 21 office holiday party early to meet his wife for a wedding anniversary celebration, but he stopped at McDonald’s for a snack on the way. 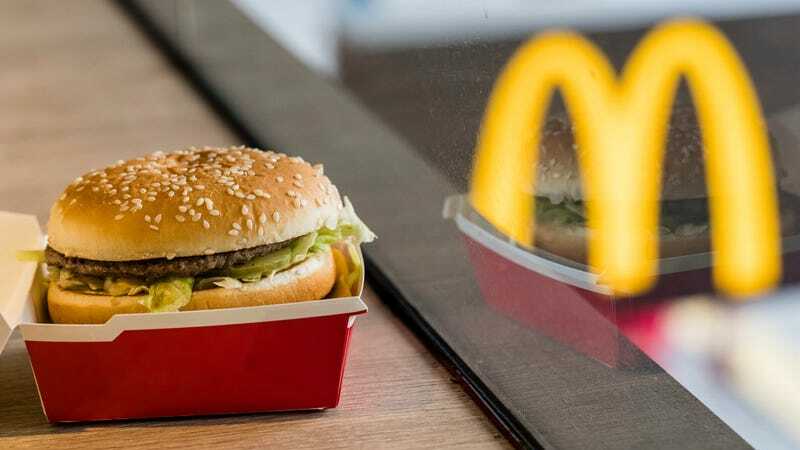 While there, he ordered a Bic Mac, no onions (his lawyer, Claire Parrot, says he has “severe allergies.”) He got a Big Mac with onions, and so he called the cops, to report the onions. When police asked him to depart the restaurant, McDonagh turned on them, falling to the floor and grabbing an officer’s leg when they tried to stand him up. As they were taking him outside, he allegedly spit in an officer’s face. Parrot said McDonagh was “embarrassed and ashamed” and is “not a violent person,” but unfortunately being embarrassed, ashamed, not usually violent, drunk, festive, married, and allergic to onions is not an excuse for spitting on a cop. He was charged with “assault by beating of an emergency worker and being drunk and disorderly in a public place,” sentenced to a year of community service and 120 hours of unpaid work, and was fined £190 (almost $250 U.S. dollars). In conclusion, don’t call the cops because your food order is wrong, unless it’s wrong because someone put poison or, like, a severed human hand in there.